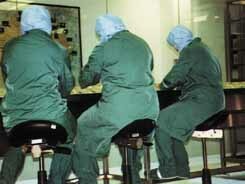 Saddle stools are used by workers who perform two-handed reaching tasks, such as dentists, surgeons, laboratory technicians, sonographers, musicians, hairdressers, assembly workers, machinists, library workers, artists and bank tellers. 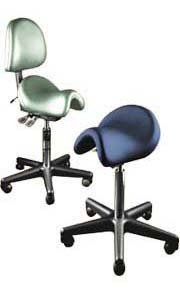 Saddle stools are used by office workers, especially those whose computer tasks are combined with paperwork. Saddle stools are used at high counters and in environments where knee space is limited. Saddle stools are medically prescribed for the relief of back and neck pain, hip and knee arthritis, and to improve leg circulation. Saddle stools are used by people with neurological deficits, with diagnoses from cerebral palsy to hemiplegia, to improve sitting posture and safety. 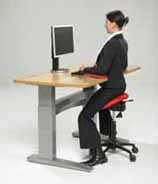 Saddle sitting improves balance, so much so that some who have to be strapped into a conventional chairs to prevent falling, can sit independently in a saddle chair.